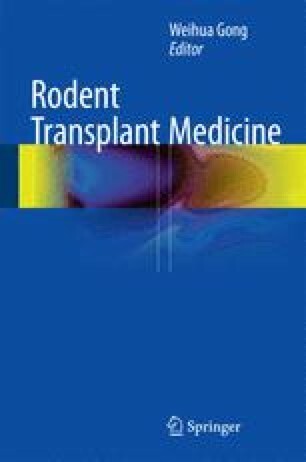 Rat kidney transplantation is an important experimental model to mimick clinical scenarios in view of the challenging techniques of mouse kidney transplant model and a similarity between rat and human physiology. Indeed, the first heterotopic/orthotopic kidney transplantation in rat was respectively established by Fisher B and Lee S in 1965 (Fisher and Lee 1965) and by Daniller A et al. in 1968 (Daniller et al. 1968). Thereafter, this model has been widely used for experimental studies and enhanced our understanding of transplant immunology, the rejection process, and prevention strategies (Gong et al. 2009). To achieve the techniques better and faster, many attempts have been made to modify surgical procedures and improve this model including the sleeve anastomosis, a nonsplinted ureteroureterostomy, utilization of the donor inferior vena cava, and ureter implantation technique. Herein, we introduce a reliable, reproducible transplant model with fewer complications on basis of the successful experimental practice in Germany. Although utilization of both donor kidneys is practically feasible, short length of right renal vessels makes transplantation technically more difficult. Therefore, this transplant model is established using left kidney.